A few weeks ago, Congress approved and the President signed the NASA Authorization Act for 2010, outlining a human spaceflight policy that will grow a commercial transportation service to low Earth orbit and focus NASA’s human spaceflight community on exploration beyond low Earth orbit. The proposed top-line budget number for NASA contained in both the President’s original budget submittal in February as well as in the Authorization is $19.0 billion for fiscal year 2011. However, Congress adjourned for the mid-term elections before passing a budget, instead option for a continuing resolution to fund the government through December 3 at last-years levels. Authorization is not the same as appropriations, and it is the latter that will ultimately determine what NASA does, and what it won’t do. Therefore, we’re left with some uncertainty lingering in the air until Congress reconvenes and deals with appropriations. 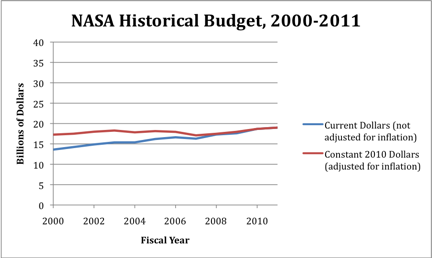 Will NASA’s top-line budget number remain at or near $19.0 billion for 2011? To frame this question and discuss potential impacts to NASA, let’s consider the possibility that the House majority switches parties in the coming election. (As of today, Nate Silver’s “Five Thirty Eight” places the odds at 83% that the Republicans will control the 218 seats needed for majority.) In its Pledge to America, the Republican party pledges to “…cut government spending to pre-stimulus, pre-bailout levels…” which I’ve heard interpreted as “to fiscal year 2008” levels. What has NASA’s budget history looked like, and what would such a pledge mean to NASA’s top-line budget? Here is a plot showing NASA’s budget in current dollars without inflation factored in, and in inflation-adjusted 2010 dollars. 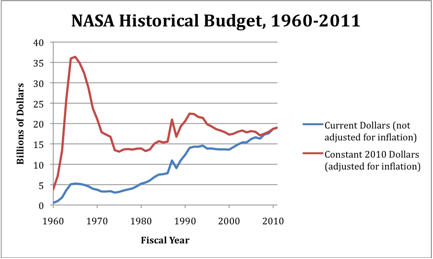 In inflation-adjusted dollars, NASA’s budget has been relatively flat since 2000, averaging about $17.9 billion. The fiscal year 2011 proposed budget of $19.0 billion is actually above the recent historic norms. Suppose for a minute a Republican House makes good on its Pledge to America, and starts the conversation in appropriations for NASA’s budget at 2008 levels. Where would that place it? 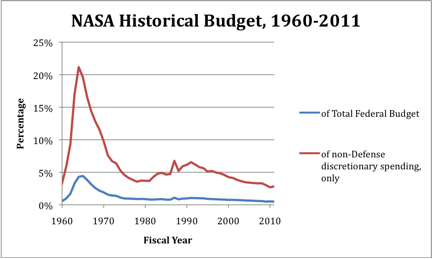 In inflation-adjusted dollars, NASA’s 2008 budget was $17.5 billion. Therefore, I think it reasonable to expect that the House appropriations committee might start the conversation for NASA’s budget at $1.5 billion lower than the authorization and the President’s budget. The result likely won’t be that value, since the Senate is projected to remain in Democratic hands (as of today, Silver says 88% chance the Democrats will control at least 50 seats in the Senate). The art of compromise will lead to an appropriated NASA budget somewhere in between $17.5 and $19.0 billion. Where? Your guess is as good as mine. Pragmatism suggests that I should be aware of all the above pressures as I construct a future procurement strategy for my organization. The piece contributed by current Government-sponsored human spaceflight programs will continue to come under fiscal pressure; perhaps it is prudent to consider something more than a reliance on existing Government programs for the strategy to come. Hmm, that is an intriguing thought….